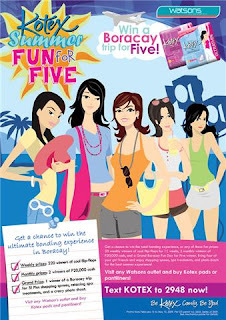 Kotex Fun for Five Promo ~ Philippine Freebies, Promos, Contests and MORE! Girls using Kotex products are in for a treat this summer with Kotex Fun for Five Promo. Just buy Kotex pads or pantiliners and you may just find yourself soaking up the sun at the soft sands of Boracay with 5 of your BFF where you will be treated to shopping sprees, spa treatments and a photo shoot. And to get you ready for the beach, Kotex is even going to give you gals Roxy swimwear and flip-flops. If you don't get the grand prize, there's still a chance for you to take home some CASH in the monthly draws and flip-flops in the weekly draws.